The system is called "Super Hi-Vision" and it delivers a signal with a resolution of 7,680 x 4,320 pixels. That’s four times better than the latest 4K televisions and 16 times that of regular HDTV. Simply put, the image quality is amazing. It's been under development by Japanese public broadcaster NHK for the last couple of decades -- before most people had even made the switch to high-def LCD TVs -- and test broadcasts began earlier this year with arts, science and music programming and daily highlights from the Rio Olympics. Right now, those test broadcasts are limited to receivers within NHK, but a service for the public is due by 2018. 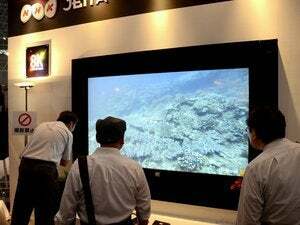 Japanese electronics manufacturers are working on TVs and receivers for the broadcasts and early prototypes are on show this week at the Ceatec electronics show near Tokyo. 8K TV reception isn't without its challenges. The biggest one is managing to process the 8K satellite TV signal in real time. It has a data rate of around 100Mbps, so receivers need a significant amount of power to be able to handle it. 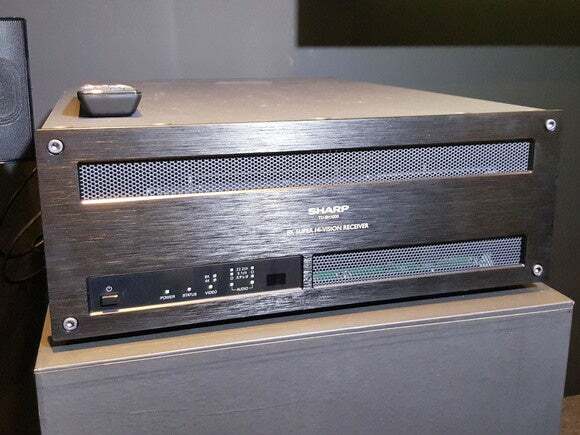 At Ceatec, Sharp was showing off what it says is the world's first 8K satellite TV receiver. The unit was about the same size as a desktop PC on its side and had large grilles at the front, presumably to aid cooling. A prototype receiver for 8K satellite TV broadcasting developed by Sharp and on show at Ceatec Japan on October 4, 2016. A much smaller prototype set-top box was being demonstrated nearby for cable TV broadcasts in 8K, which use a slightly different format to those of satellite. It was using a new video processing LSI chip developed by Socionext, a company formed last year through the merger of the LSI chip businesses of Fujitsu and Panasonic. 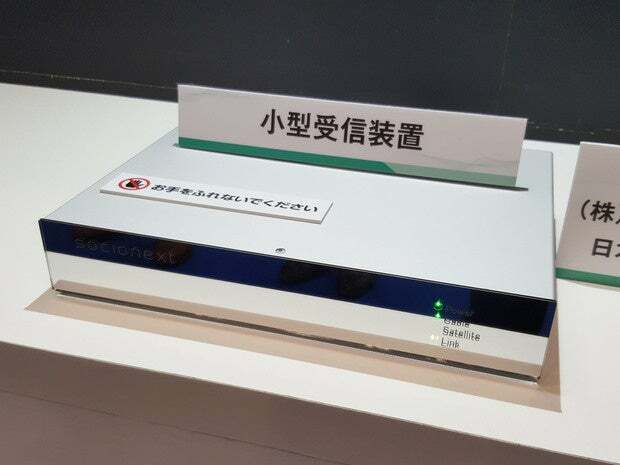 A prototype cable set-top box for 8K broadcasts using a new video processing LSI developed by Socionext, on show at Ceatec Japan on October 4, 2016. And NHK was showing off a massive hanging 8K television that it had developed with panels from LG Display. The 130-inch screen was made by stitching together four 4K panels -- something that left visible black borders between each smaller panel -- but still meant for an amazing picture. 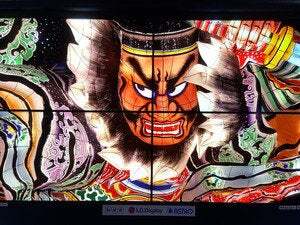 An 8K display made up of four 4K panels and developed by NHK, on show at the Ceatec electronics show near Tokyo on October 4, 2016. The screens were just 1 millimeter thick and the entire display, with backboard, was 2 millimeters thick -- about the thickness of three credit cards. 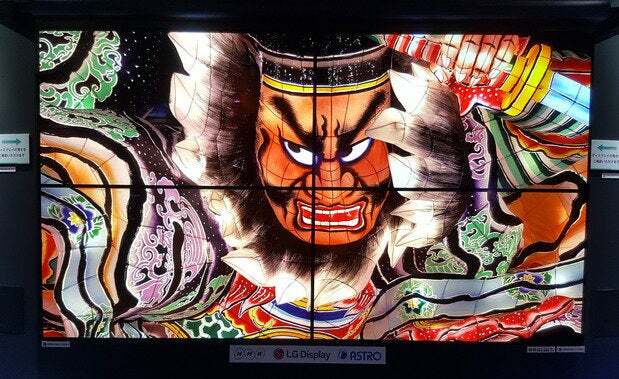 Development of 8K technology is accelerating in Japan thanks to the start of test broadcasting in August. The industry has pledged to provide coverage of the 2020 Tokyo Olympic Games in 8K, in Japan at least, so there's a clear deadline for everything to be ready.